Watercolour of the landscape near Moradabad from 'Views by Seeta Ram from Cawnpore to Mohumdy Vol. IV' produced for Lord Moira, afterwards the Marquess of Hastings, by Sita Ram between 1814-15. Marquess of Hastings, the Governor-General of Bengal and the Commander-in-Chief (r. 1813-23), was accompanied by artist Sita Ram (flourished c.1810-22) to illustrate his journey from Calcutta to Delhi between 1814-15. Moradabad, in Uttar Pradesh, was founded around 1625 by Rustam Khan, the governor of Katehr, who named it after the imperial prince Murad Bakhsh. The Afghan Rohillas acquired Moradabad in 1740 and controlled the city until 1773 when it passed to control of the Nawab of Awadh. Nawab Shuja ud-Daula of Awadh (r.1753-1775) subsequently ceeded part of his territory including Moradabad to the Britsh in 1801. Illustration of the Moradabad landscape including the Seemal tree. The Seemal is a large tree with crimson flowers and pods with cotton known as 'Bombax malabaricum.' 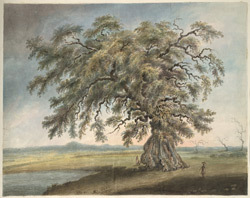 Inscribed below: 'Semool Tree about 57 feet in Circumfrance' [sic] ' near Moradabad.' In pencil in 'kaithi: karimajal'?